Living a short boat ride from Seattle, the birthplace of Redfin, we see more Redfin here than most places. And once an idea is born, like a virus . . . it spreads. Looking at the model of discounting, I do not have issue with that. What I, and many other agents have issue with is that Redfin (and others like them), utilize the efforts of outside agents to cut their costs and save their company money. Which is why many listing contracts state that buyer’s agents must be present at all showings (this topic could be discussed in another full blog entry). Case in point, this is an experience that happened to me recently. An agent from a Redfin-like brokerage on Bainbridge Island contacted me, the listing agent, to see one of our Coldwell Banker listings on the island. His e-mail to me stated he and his one associate were both out of town, but they had out-of-state buyers here for the weekend who really wanted to look at my listing tomorrow. He asked if I, the listing agent could show his clients my Coldwell Banker listing. Now, as a listing agent, I want to sell my listing. I am always looking out for the best interest of my sellers. However, the buyer’s were not my clients and this brokerage, who pays back part of their commission to their clients wanted me, to do the leg-work involved in working with their buyer. On a sunny Saturday, I was fully-booked, and it left me in an awkward position. Should I get another agent from my office to do this work, for another brokerage? To add to the matter, these buyers, who were purported to be out-of-state folks were actually from Seattle, I found out after talking to them. The entire scenario smelled fishy to me. If I had out of state buyers in town, I would have it circled on my calendar and I would arrange coverage if I was out of town myself. You see where I am going with this. My suspicions are that this is the M.O. of this brokerage, to get listing agents to do their work for them. Not only is that unfair, I get really cranky when I am lied to. I talked with these buyers at the end of their day looking at homes on the island, without their agent present (I am guessing they were showed homes by listing agents all day) and from our conversation, it was clear they got an earful form some unhappy agents not pleased about doing other’s work for them. It comes down to this, this other brokerage, by not doing the legwork of an agent, is admitting that there is work out there that buyers agents need to be paid for – they just aren’t going to be the ones doing it. They are saying hey, we will save you money because we are not going to charge you for the legwork, (we’ll get someone else to do it for us, for free, he, he). If these discount brokers want to work at a reduced rate-more power to them. In this economy, all hard-working agents are working harder for less money. This new brokerage, that is trying to make money off of my sweat – has made a bad first impression with me. My girls heading down the trail at Hawley Cove Park. I have talked about all of the great trails on the island before and there are a couple of maps for the island that are very cool. My favorite Island Guide to Walking, Cycling & Paddling, (scroll to bottom if you follow the link) however is currently out of print and I am very bummed because I love giving it to folks who visit the island or who are brand new to the island. The good news is, it is still available online and maybe will be back in print soon. There are other trail maps out there, but this one has paddling too, which is just not on every ole’ map. 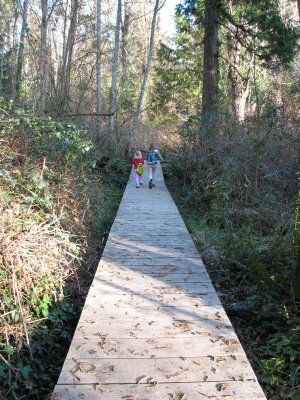 Another good trail map is Bainbridge Island Trails which uses Google Maps to plot trails for hiking and running. Many of these are trails between and around parks and some are along the water, which is great. I want to try the run from Ace Hardware to Hawley Cove Park – if it ever stops snowing. Actually, the sun is out right now, so I really have no excuse! Some local folks have plotted out bike routes along the island and those can be found on the link at Bikely. I am much too chicken to ride my bike on the island roads, but many, many others, including my husband, are not. I prefer the tranquil safety of trails at Fort Ward for biking. One last map you should know about is another trail map that give details and trail head locations for the different trails on the island. It tells you handy things like difficulty, good for kids or not, dogs ok, horses ok, or not. Others out there you like, e-mail me, I’d love to know about them. 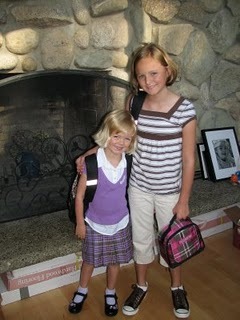 My girls looking hopeful on the 1st day of school. Yes, hopeful. I am sort of having that same hopeful feeling you have on the first day of school. Hopeful because it is a new start. Hopeful that this year will be better than the last. Hopeful that this year – anything is possible. Hopeful sums up January real estate on Bainbridge Island. Our sales volume is up, mortgage rates are down, and buyers are easing themselves down off of that very tall fence. Don’t forget about the $7,500 first time buyer’s credit that is out there for folks who have not bought a home in the last three years, people are using it. I am sensing movement in the right direction. Here is why I say this. In short, there are buyers out there in all price ranges and inventory has come down. There are currently 198 homes on the market compared to the high of 304 in June of 2008. More about inventory on Bainbridge Island in future posts. More about hope.